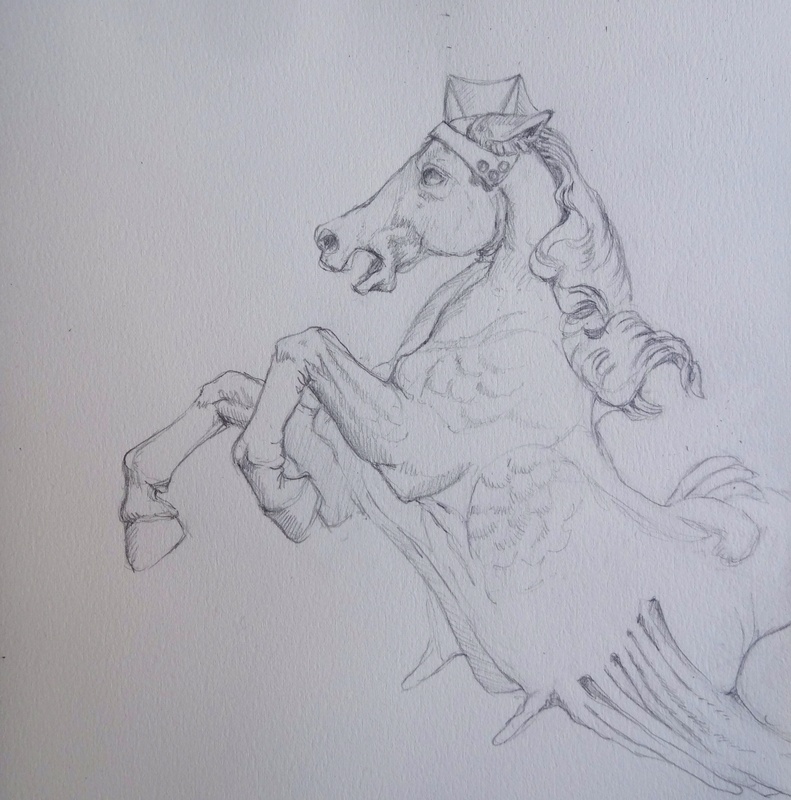 This morning was slow and relaxed as I was a bit tired after yesterday’s drawing class and the evening at the ballet. 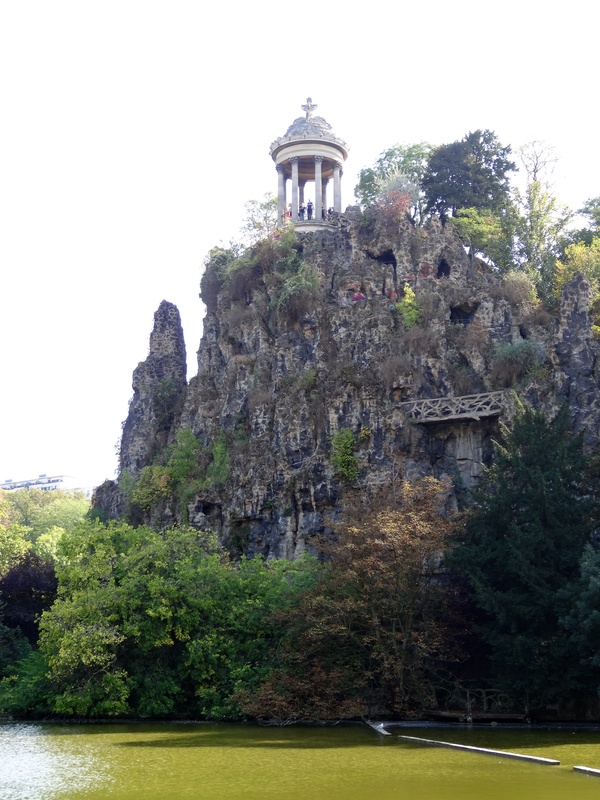 I finally got myself out the door after noon and set out to walk to the Parc Des Buttes Chaumont which is a 25 hectare park in the 19th arrondissement. 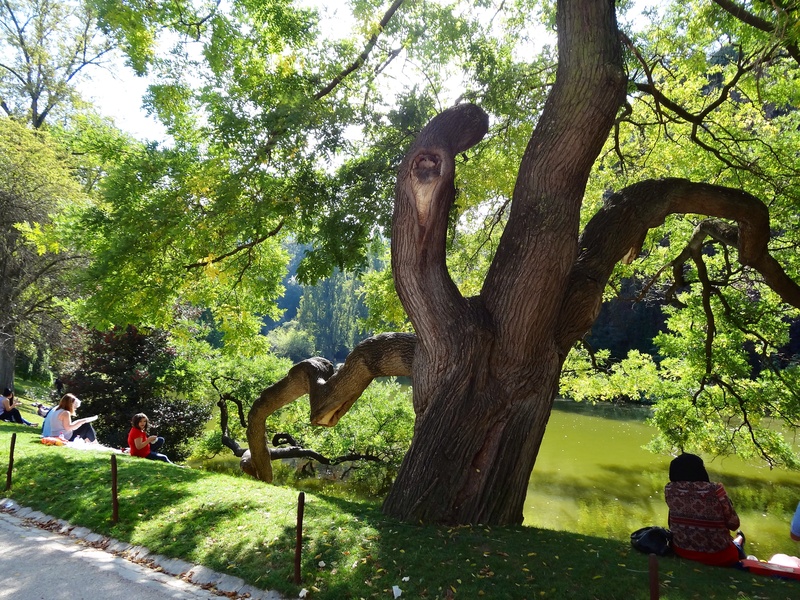 It is a beautiful place, and although it has many man made features this park does not feel as though it is in the city. 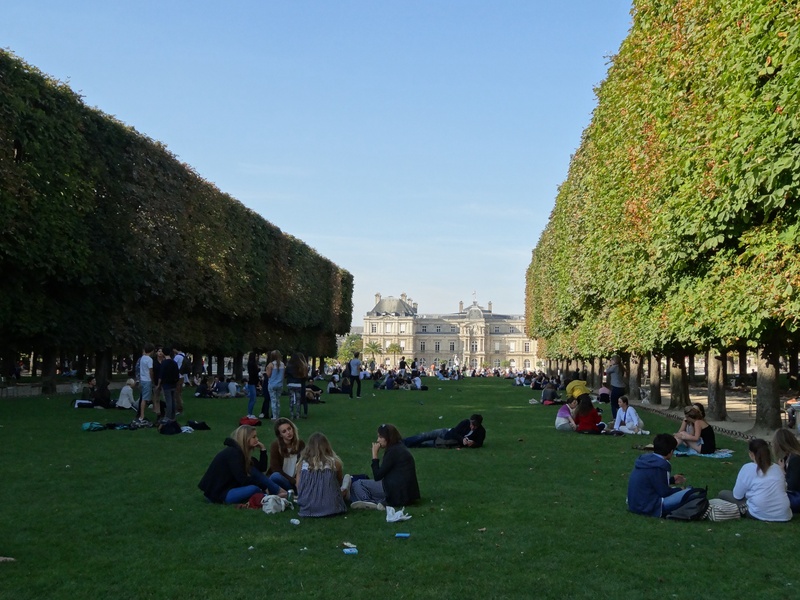 Most of Paris’ parks are carefully manicured, laid out geometrically and have paved or gravel surfaces with benches or chairs. There are not many parks that actually allow people to walk or sit on the grass, which I found strange at first, but when I once I thought about the density of population in this city and realized how many people use the parks I realized that this is a necessity, or the grass would be trampled and dead. 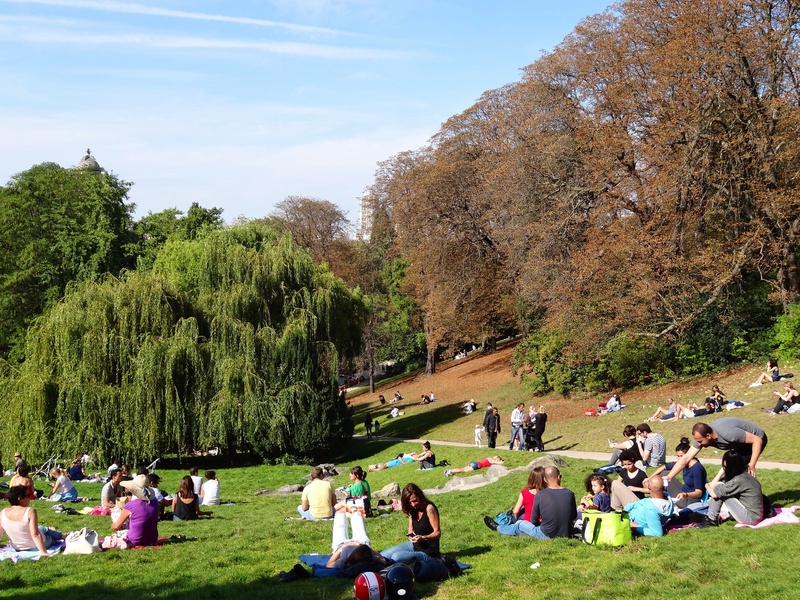 The Parc des Buttes Chaumont, however, is a park that welcomes people onto its many grassy hills. There were lots of people out enjoying the warm day. I saw everyone from individuals relaxing, sleeping, reading, or playing the guitar, couples having a romantic picnic complete with a bottle of favourite wine, families enjoying the sun with their children to large gatherings of family and friends, sharing a meal and visiting in the sunshine. Because it was once a quarry there were lots of hills to climb, including one up to a ancient looking little structure on an island which is also the highest point in the park where it’s main attraction can be found, the Temple de la Sibylle, a miniature version of the famous ancient Roman Temple of Vesta in Tivoli, Italy. 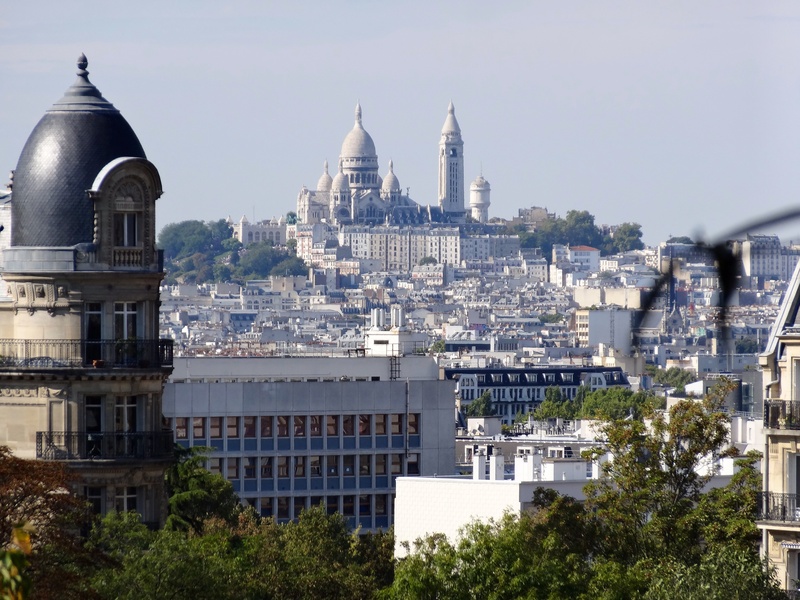 Sacré Coeuer is visible in the distance from here and there is quite a good view. If you are interested, Wikipedia has a very interesting write up about the history and construction of the park. 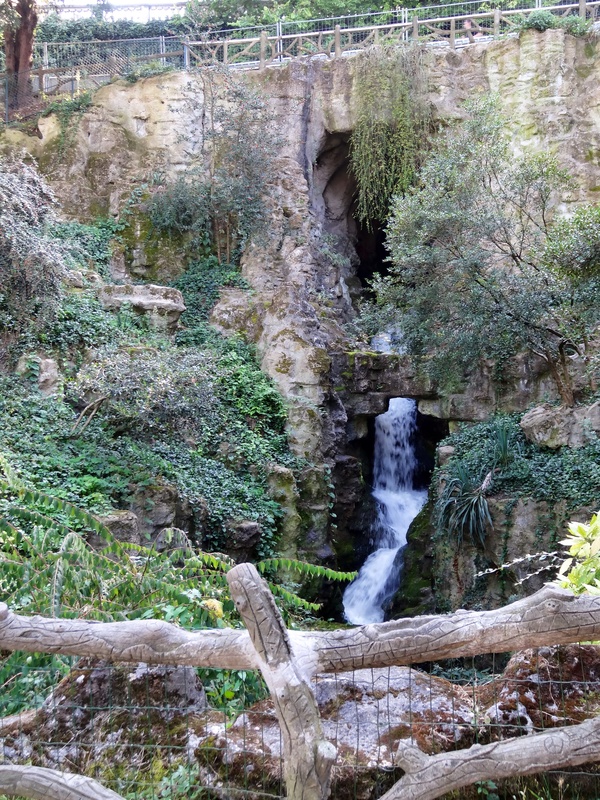 There are also a couple waterfalls, and a swinging bridge that crosses the man made lake to the island, and lots of flower beds which have signs describing what is planted in each bed. 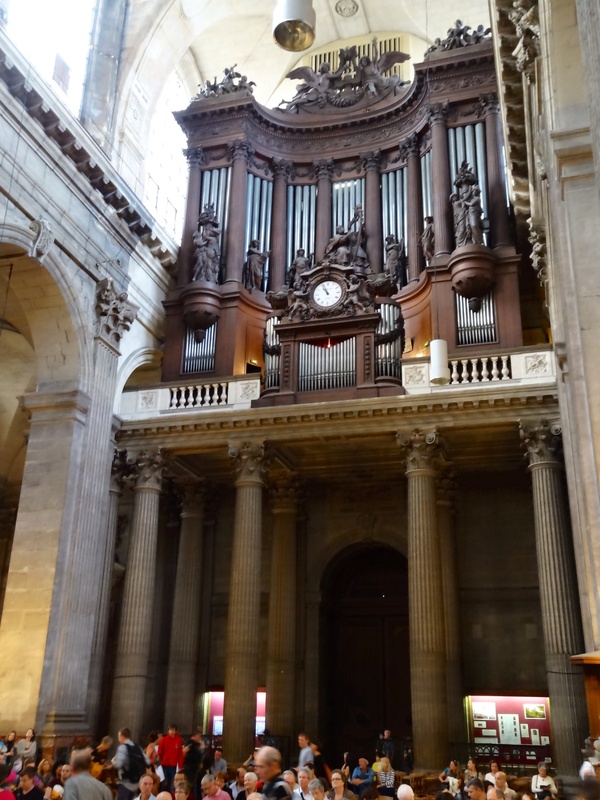 I spent a couple very pleasant hours wandering about and then decided that I should go to St Sulpice for an organ concert at 4:00. The organist was from Thomas Dahl, from Hambourg and the music was incredible. I sat with two Susan’s, one from California and one from Newfoundland who were two friends spending a week together in Paris. They had both been to Edmonton and St. Albert, which was rather surprising. They were sitting in a special area with comfy red cushions and they made room for me to sit beside them. 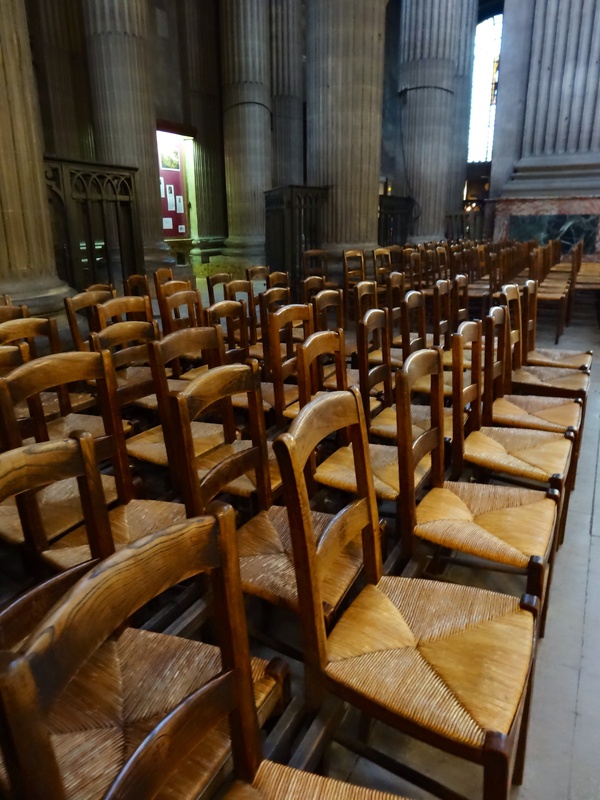 It was much more comfortable than the chairs that are used for the congregation and guests visiting the church. I was sitting in the raised box at the back of this picture, right in front of where the white statue is located. Next stop was the Marais. This was the area where I had first reserved an apartment, it was behind the red door in this picture, but the reservation was canceled because one of the neighbours was having some ‘mental’ problems and the owner was not comfortable renting her place until things got settled. I actually think that I like the area I am in better. 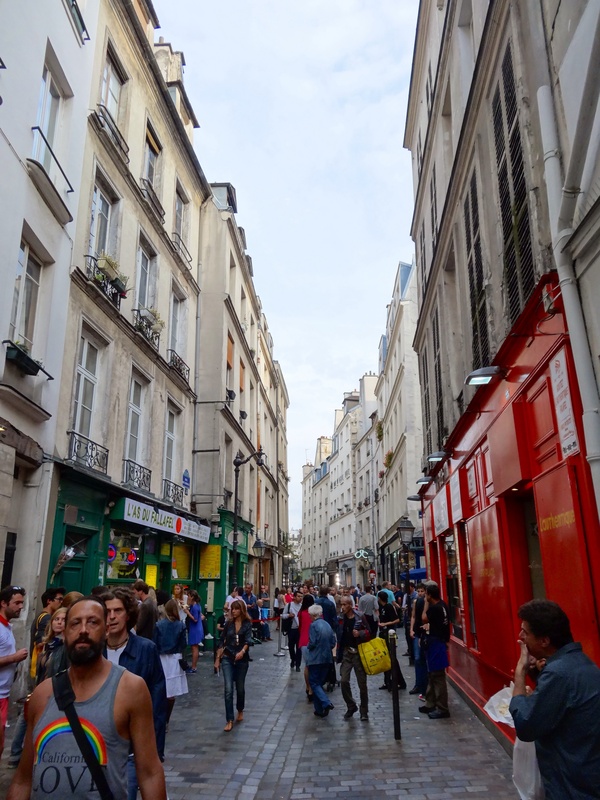 It is further out, but it is a real Parisian neighbourhood. 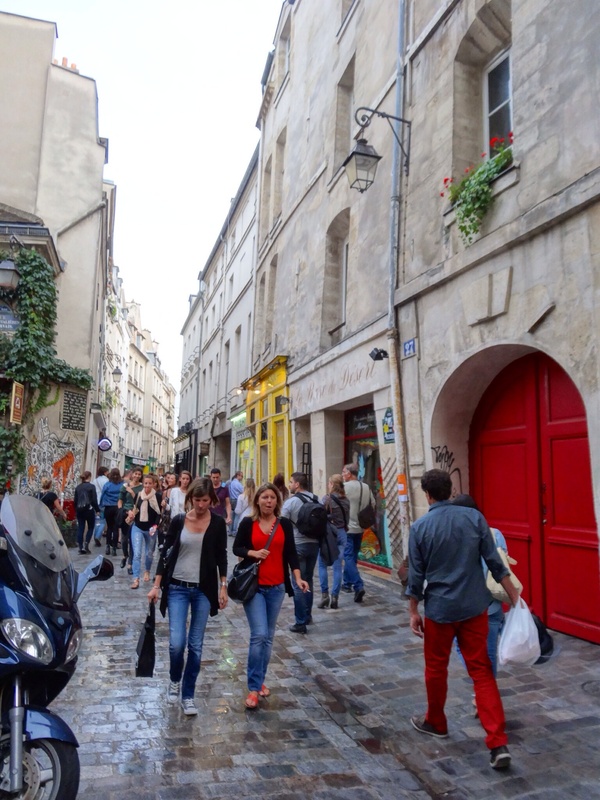 The Marais has become a tourist attraction, lots of shops and bars and tourists everywhere. I went into one store and the clerk didn’t even look up when I entered. In ‘my neighbourhood’, I am greeted with Bonjour madam, and a smile. 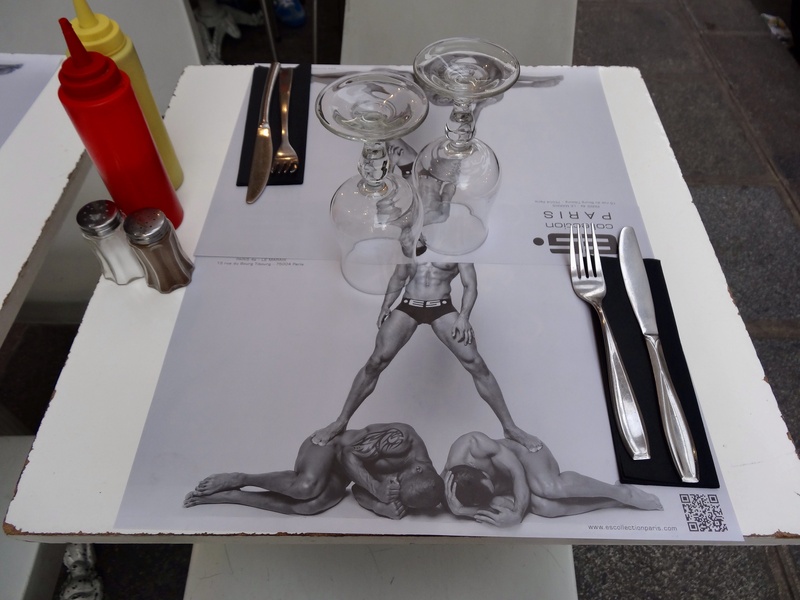 The Marais has also become a centre for gay tourists and residents, which made for some interesting sights. I made a friend though. This little girl ran away for her mother, whose arms were full of groceries. I stopped her and told her to go back to her mother, and actually did this in french without thinking too much about it at all! She ran back to her mom but turned around to look at me, so I waved to her. We then played peek a boo and waved to each other for several minutes. I headed home for supper and a FaceTime chat with my son at eight. I must say that I love how easy it is to stay connected with family and friends while travelling. Today was lovely, 22° and sunny with a light breeze. A great day for exploring and wandering about Paris. I took the metro all the way to rue de la Grande Chaumiere which is where the life drawing sessions I want to attend are held. Turns out it is just around the corner from a metro station and it is very easy to get to, just one train all the way from the Gare de l’Est, which is about a ten minute walk from my apartment. I love the metro, it is easy and fast and offers such great people watching. The Academie was closed so I didn’t get any more information, but I will try to attend one of their sessions soon. I decided to walk back and see what I could see, only there is so much to see that I barely knew where to look next. 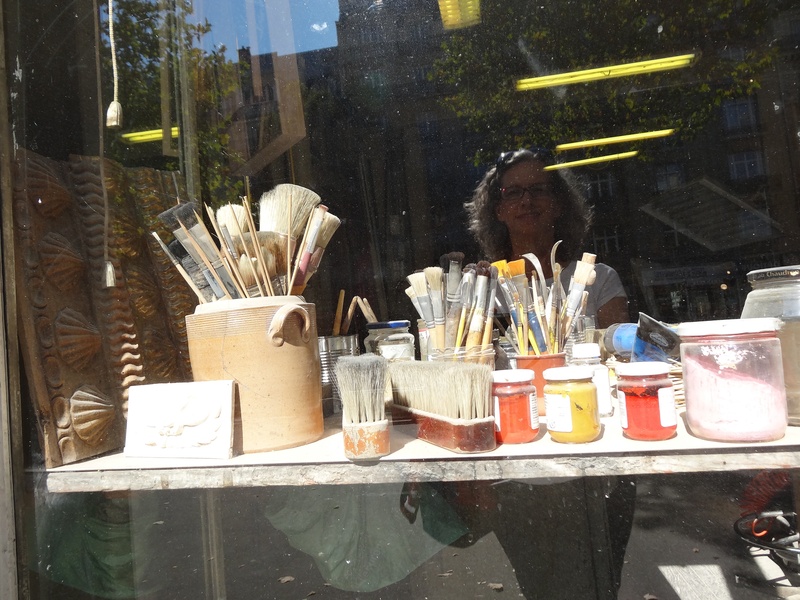 I stopped to take a picture of of some brushes in a shop window that does art restoration along Boulevard Montparnasse and then headed towards the Luxembourg Gardens. 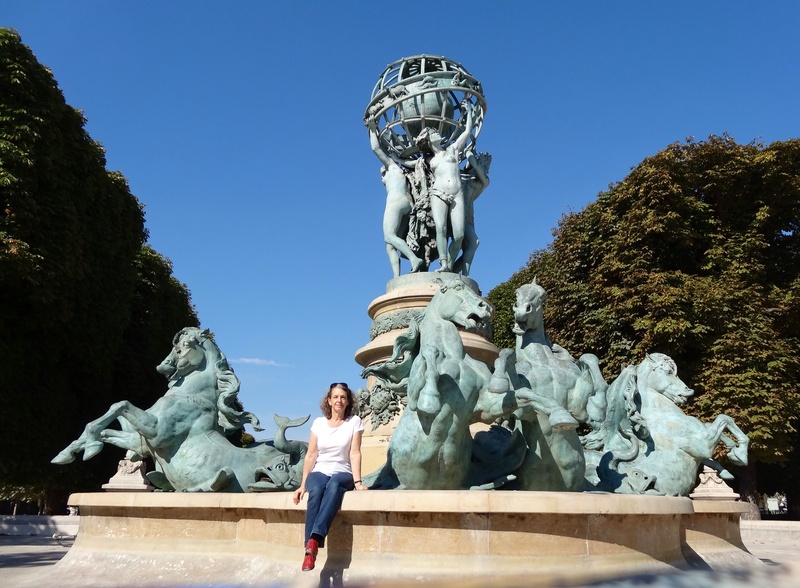 At Place Ernest Denis I found a great fountain with horse sculptures that caught my attention. I decided to draw, and settled down in a quiet corner, but soon the park was full of children playing after school. They were curious but didn’t approach until one brave little boy came over to see what I was drawing. I was then very quickly surrounded with about twenty children who wanted to see my sketch and asked questions and told me things, not all of which I understood. 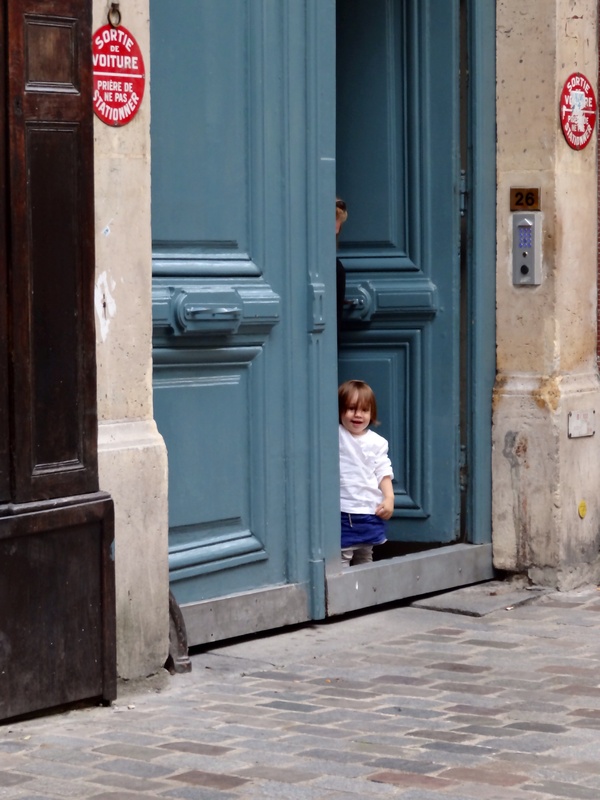 One little girl very knowingly said, “ah, vous etes Anglaise”, after I said something in French. After finishing my drawing I strolled through Luxembourg gardens, remembering the last time I was here with Bob. We had a picnic on the grass just as so many people were doing today. Picnicking, reading, talking, playing cards, I even saw one man repeatedly lick his girlfriend’s foot! Not something you see everyday. 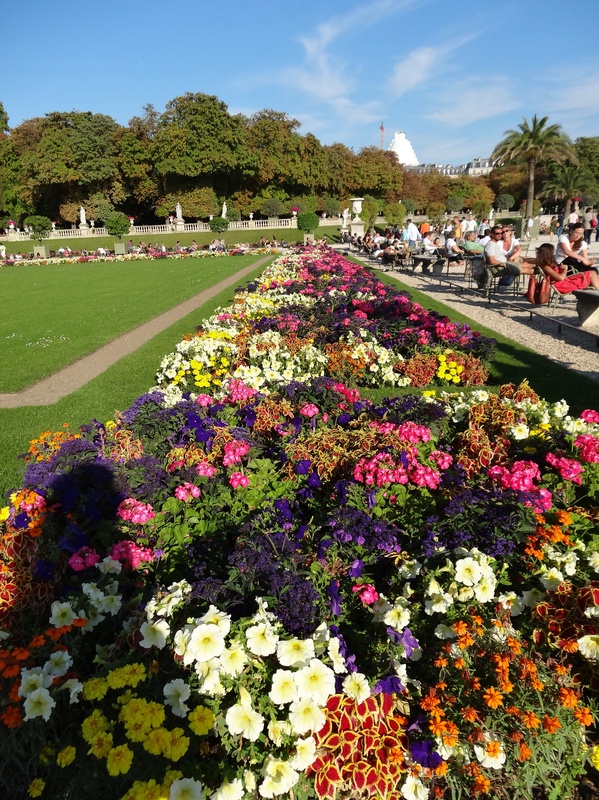 Parisians love their gardens and green spaces, I can’t believe how many people are out in them everyday, and the flowers are amazing. 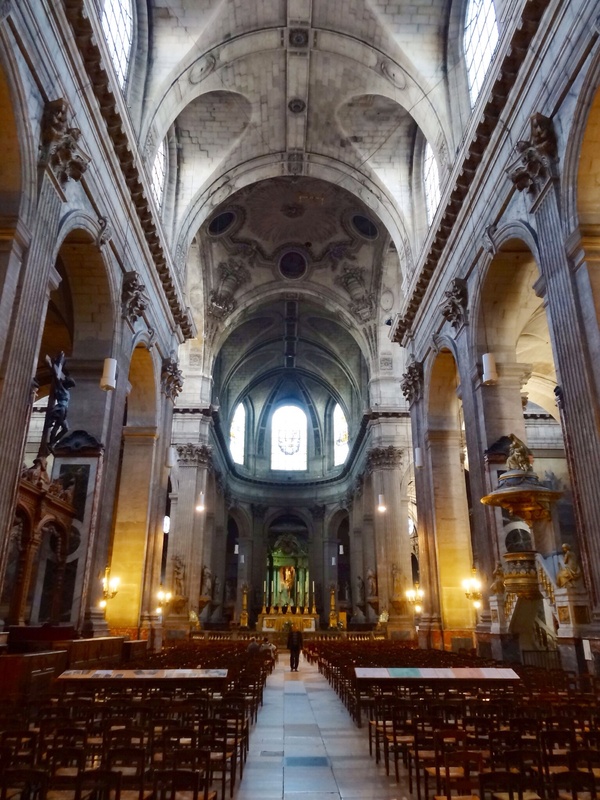 I am truly in a state of awe when I visit these cathedrals. I touch the stone and wonder about all the people who have been here before me, perhaps touching this exact spot. 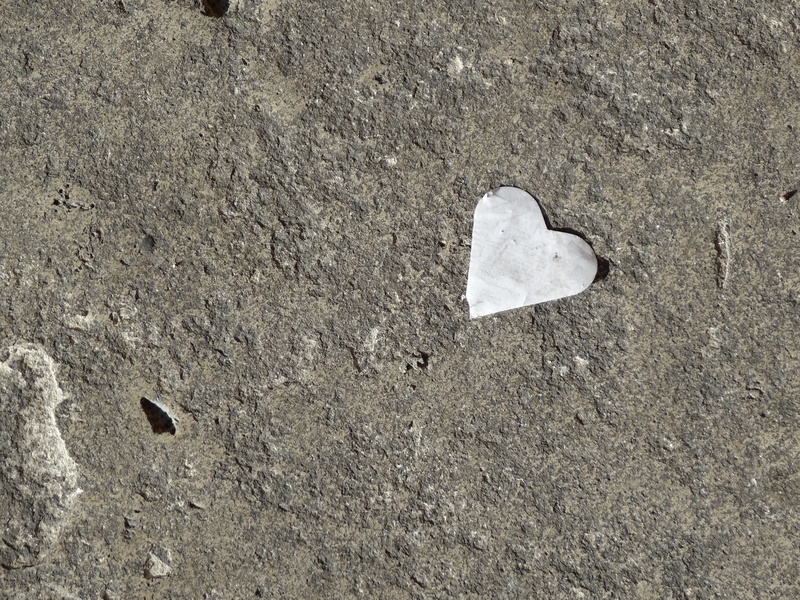 Then I turned around and saw this…. 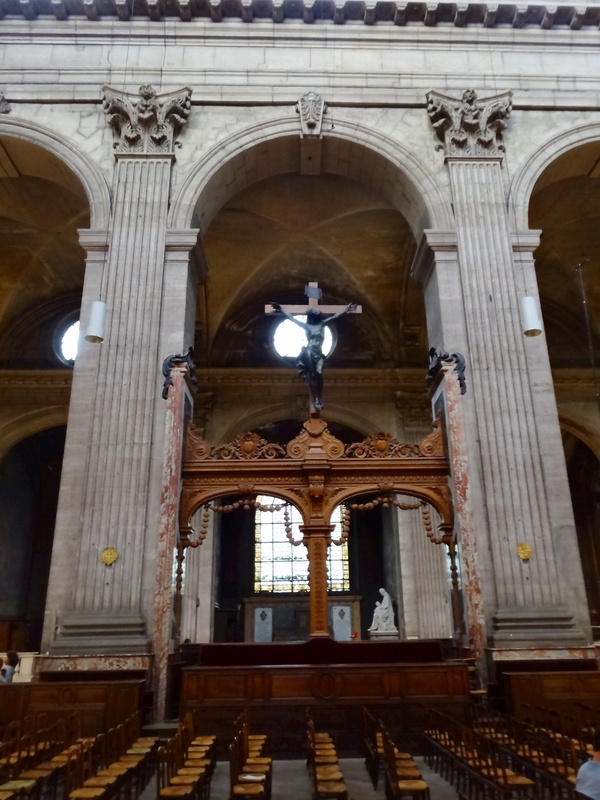 It was in a little side chapel called the Chapel of Holy Angels, that had three large Delacroix paintings, painted between 1855 and 1861. 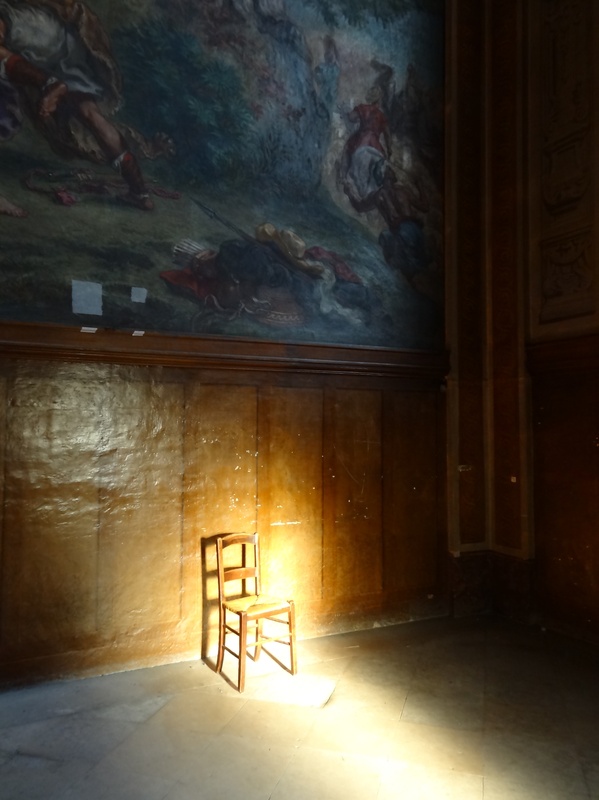 Just below one of these huge paintings there was a chair, illuminated by the late afternoon sun and it felt as though, just perhaps, an angel was present.